Australian War Memorial dedicated in the presence of Her Majesty the Queen, the Hon John Howard MP Prime Minister of Australia, the Rt Hon Tony Blair MP Prime Minister of the United Kingdom and contingents of Australian and British veterans, 11 November 2003. 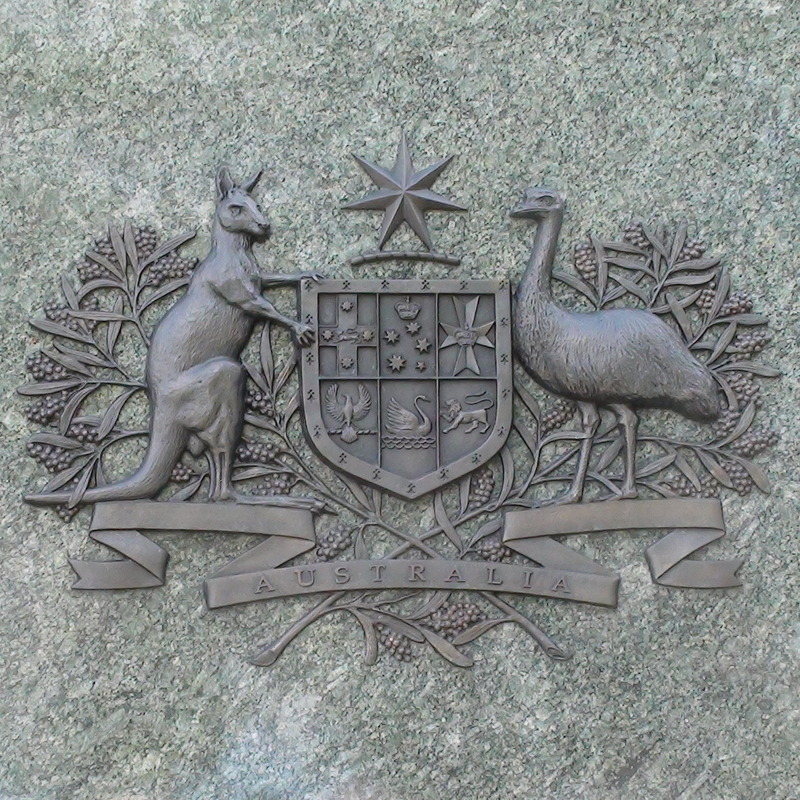 This memorial honours the commitment of Australians who served alongside Britain and her allies in defence of freedom in the First and Second World Wars. The battle sites are representative of the many places where Australians, together with their comrades, fought and died. The place names record the origins of Australian servicemen and women many of whom were born in the United Kingdom and elsewhere. Each is a reminder of the impact of war on families and communities. The flow of water over these names evokes memories of service, suffering and sacrifice. 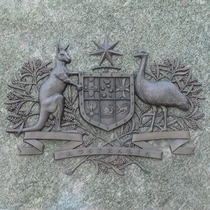 Whatever burden you are to carry we also will shoulder that burden (Robert Menzies, Prime Minister of Australia, 1941). Green Western Australian granite, with polished slabs forming a curved wall carved all over with the 24,000 names of the hometowns of the killed, in a small font. The 47 names of the battles are in a much larger font, cleverly made up of the letters from the hometowns, emerging in a rather ghost-like way. More slabs of granite rest against the lower part of the wall. Water runs down the sides of the wall and, on the day we were there, a rather unpleasant glugging sound was coming from the water works under the monument. The hometown names are not, as far as we could tell, arranged in any particular sequence so it is nigh on impossible for anyone to locate their own. This seems a mistake; surely finding their grandfather's name, or hometown in this case, is what people like to do at war memorials? Ahoy has pictures of the opening ceremony. Polynational War Memorial has photos and a commentary. We took our photo from the top of the Wellington Arch. Prime Minister of Australia. Born Sydney, Australia.